The coordination of all of these elements can only be developed through practice. The difficulty is in finding training methods that help foster these elements. When students try to punch hard they typically try to be strong which results in tensing the muscles defeating the purpose. With my students I work on building it in sections. I will have them keep their arms totally relaxed while they try to use their hips and shoulders to drive their punch. For the younger students I call this noodling (keeping your arms like noodles) which helps them understand the concept. As they get better I then have them add in the remaining elements so that they can work on the total coordination. They finally understand when they can deliver an extremely powerful strike while using what seems like a small amount of effort. 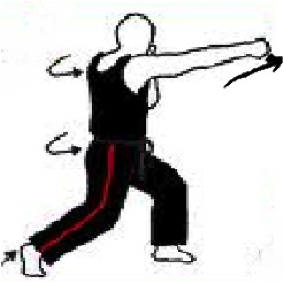 The same training technique also works for linear kicks such as side or front snap kick although it is more difficult to try to relax your legs when you are standing on them. Also humans are typically more coordinated with their arms and hands than with their legs and feet because they are designed to perform more complex motions. Still, the basic premise is the same: chamber with muscles relaxed then explode with the extension. I find that this principle is much harder for the students to develop with kicks so I use certain methods to help them see it better. When kicking a heavier target such as a bag or a well supported kicking target they usually tend to push instead of snap. This is especially true of beginner and younger students. They also have a tendency to use the target to help balance them which is a bad habit to acquire. That is why I will often use smaller targets as well as heavy targets to help them develop the speed and snap. Without having a target that allows them to cheat on their technique they have to develop correct balance and body dynamics. Another item that has to be taken into account with linear techniques is when is the best point in the extension to make contact with the target. Obviously it should be sometime near full extension. This is when the striking implement (hand or foot) is near peak velocity. At the beginning of the technique, when fully chambered the velocity is zero. Also the available force is at a minimum. This is why jamming is an effective defense technique. This is shown in the following Figures 4a and 4b. Figure 4a depicts a fully chambered side kick. When the quadriceps muscle is used to extend the leg it is equivalent to a force (Fin) pushing on the knee. This force has to overcome the inertia of the leg to start the motion and the energy available is zero. Also, if the kick gets jammed at this point the force available to push off the opponent is minimal. 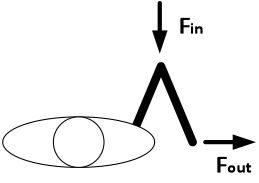 To a first order the amount of force available in the direction of the extension (Fout) is proportional to the amount of strength applied (Fin) and the bend angle of the limb. The larger the angle a shown in Figure 4b the greater the percentage of the force transmitted. A good analogy is the standard scissors jack. Without going into the math the force available in Figure 4b could be nearly five times as large as in Figure 4a. I teach my students to set up their distance such that after they make first contact with the intended target they should have an additional three to six inches of extension available. This would put full extension directly in the center of mass of a normal person. In the case of breaking you want to have your full extension be just behind the breaking target.